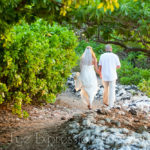 This couple was married at the Fairmont Orchid on the Big Island of Hawaii. We started in the room with some photos of the bride and her daughter along with some detail shots. Love the photo of “I Do” on the bottom of the bride’s shoes. A great way to have something “blue” at your wedding. 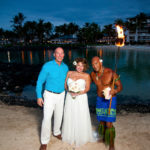 The ceremony took place at Coconut Grove located on the Fairmont property. Photos afterwards were taken along the shore, near the pond and on the lava rock.